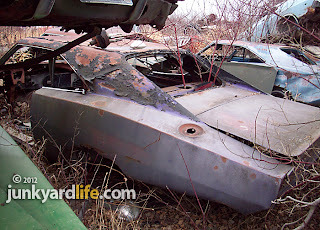 Digging up 1973-1974 B-bodies from Minnesota’s Mopar muscle car graveyard. In 1973 Plymouth’s advertising team found ways to "beep-beep" their horn about the many virtues of the latest Roadrunner. Print ads read "400 4-barrel V8. Performance hood. Torsion bar suspension. Anti-sway bars. And now Electronic Ignition." Heady stuff for a company that built a reputation on the 1/4-mile strip. 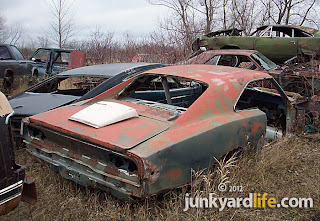 Mopar was merely playing the cards they were dealt at the end of the muscle car era. 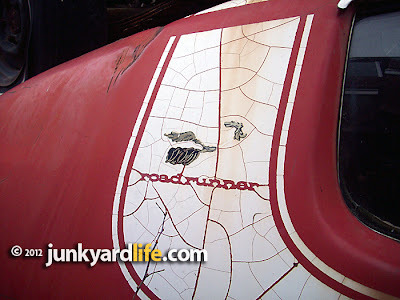 Gas prices, smog, foreign cars and big government (insurance) were busy running Roadrunners off the road. It was unfortunate timing for the redesigned "fuselage" B-Bodies, which first hit the streets in 1971 and were updated in 1973. These shapely B-Bodies haven’t gained the huge following that the boxier 1968-1970 models claim. 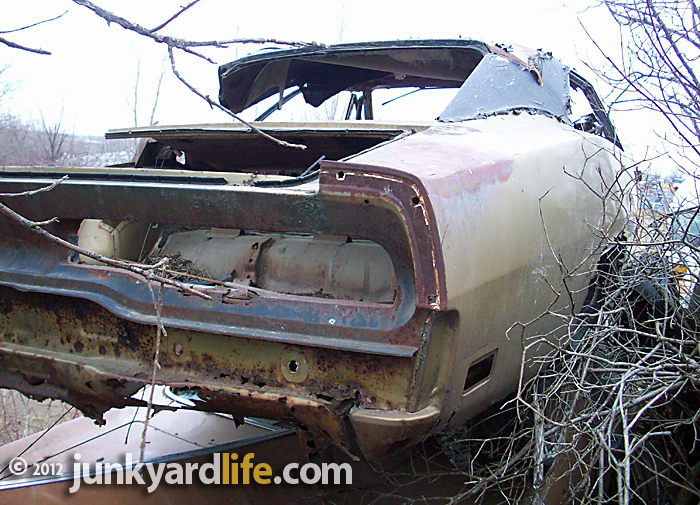 That’s bad news if your restoring a 1973-1974 Plymouth Roadrunner, Satellite or Dodge Charger. 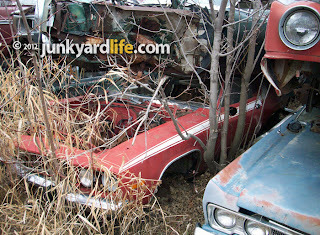 Unless your Joe Marano who found this bumper crop of Mopars in Western Minnesota. 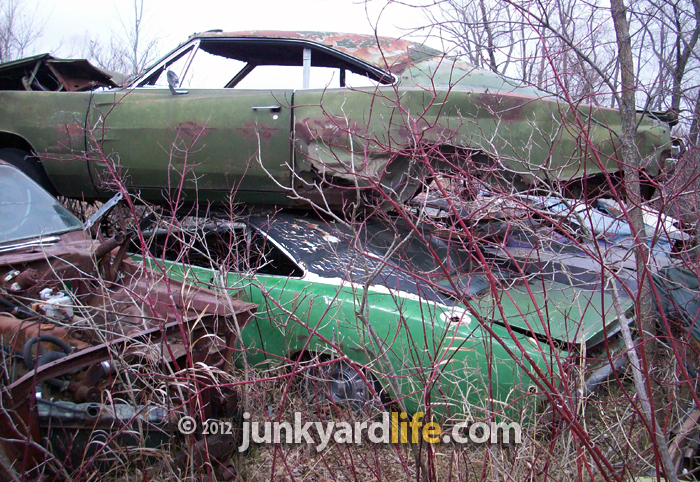 Crushing view of a 1973 Plymouth Roadrunner at this Minnesota junkyard. Sometimes hard work pays off after spending a day searching for parts. Joe Marano, of Ham Lake, Minnesota, sent us these photos from “a yard out in the sticks." 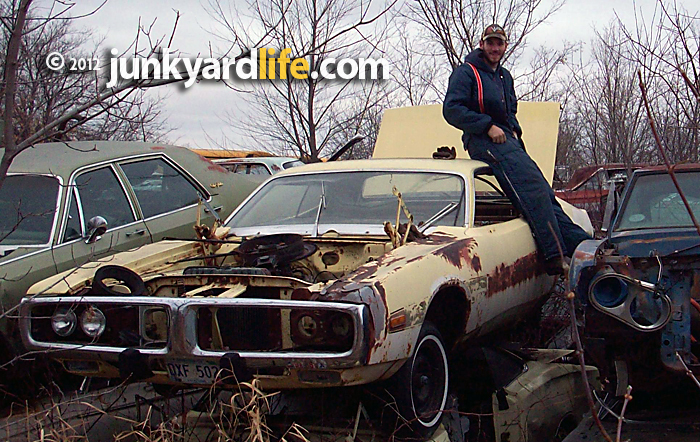 Marano, owner of a '69 Dodge Charger, isn’t ready to reveal all the details of this secret junkyard yet. 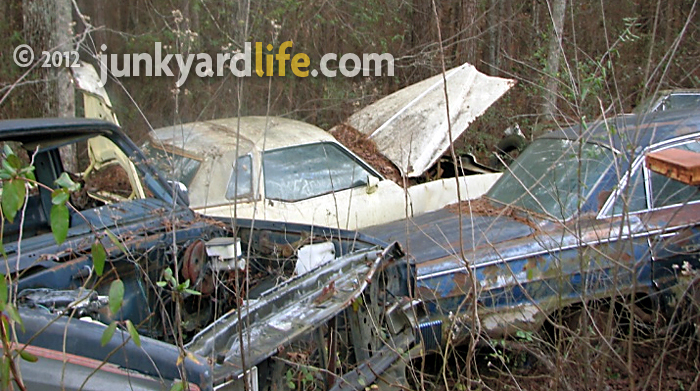 He found dozens of muscle car era Mopars in this large rural junkyard. The name and location will be revealed in a future story, so stay tuned. White bucket seats remain in this 1973 Rallye Red Roadrunner. Reproduction parts - chicken or egg? The restoration industry isn’t keen on manufacturing parts that have a limited demand. But when does a part have enough demand? 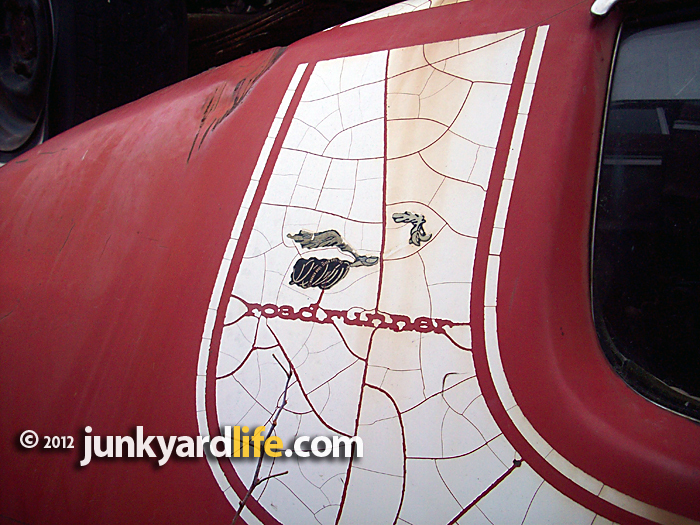 Does the lack of reproduction parts keep people from restoring ’73 Roadrunners? 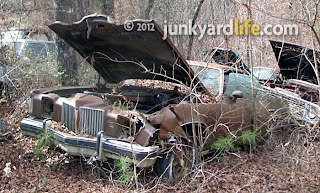 Or does the lack of restoration projects keep the new repop parts from being produced? 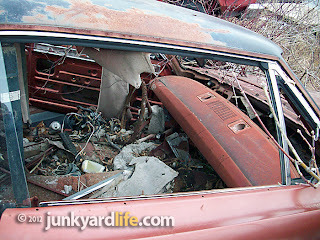 In the meantime, finding usable junkyard parts is challenging and time consuming. 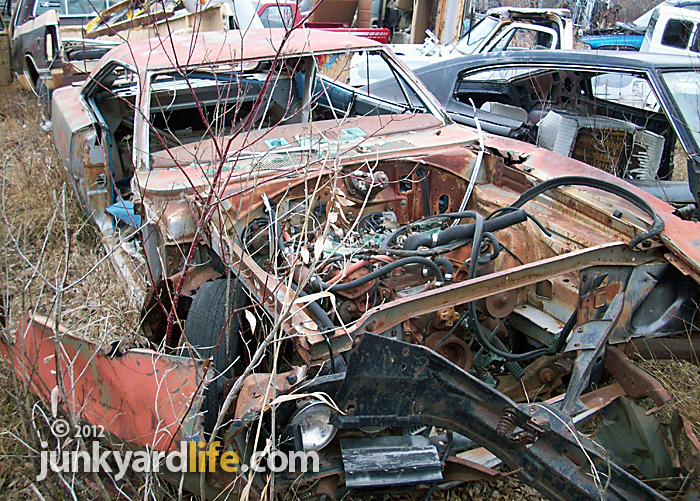 Locating a yard that hasn’t crushed all the once undesirable iron is a major score. 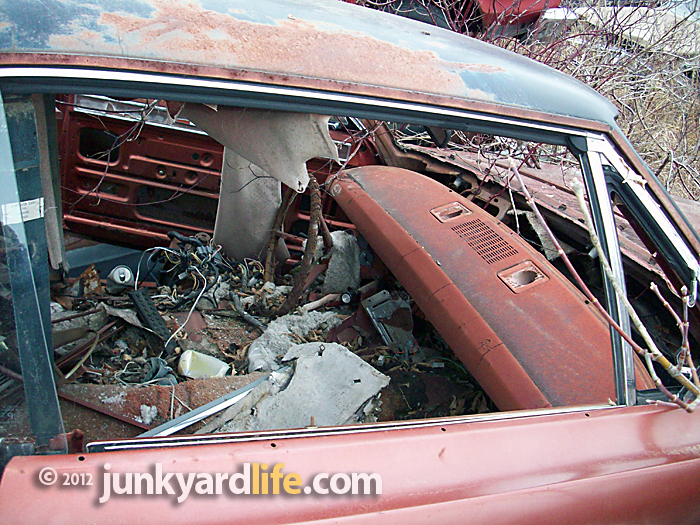 Once you find a treasure trove of hard-to-find parts you may find your willingness to share compromised. 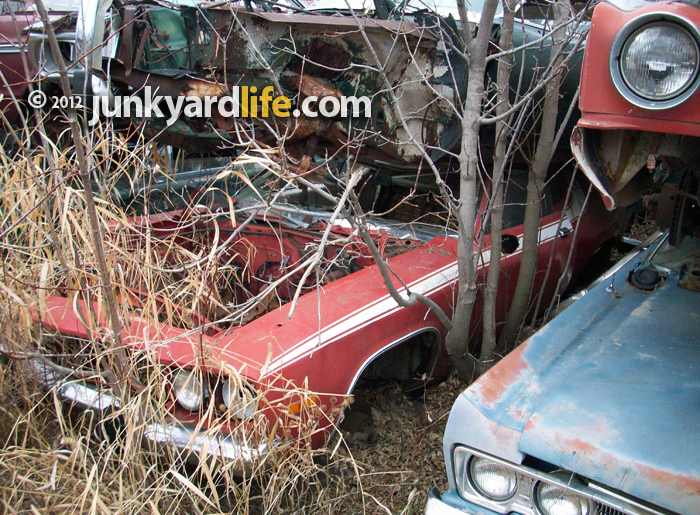 If you want to share some your prime parts picking send them my way - junkyardbull@gmail.com. 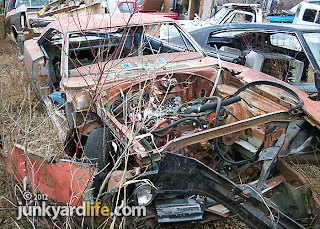 I will have more Mopars from Joe Marano soon. 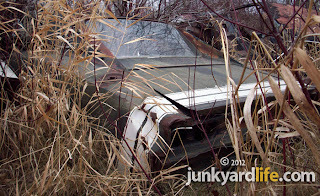 Marano keeps the wheels turning on old cars and operates Junkers Towed by Joe in Minnesota. 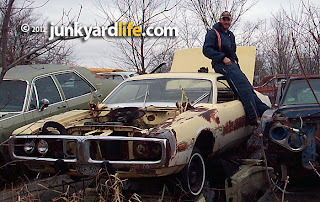 Joe Marano rests on a 1973 Dodge Charger in a junkyard in Minnesota. 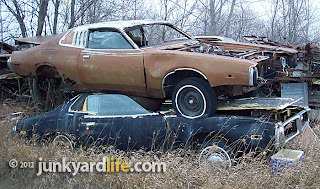 A pair of 1973 Dodge Chargers, the top an SE model. 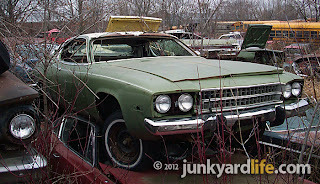 Junkyard 1973 Plymouth Satellite in Amber Sherwood green paint. Rallye Red 1973 Roadrunner pounding the ground at this Minnesota junkyard. 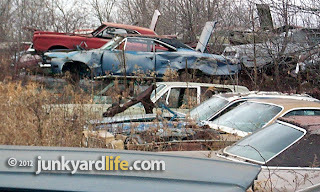 Mopar muscle car graveyard, B-body edition. 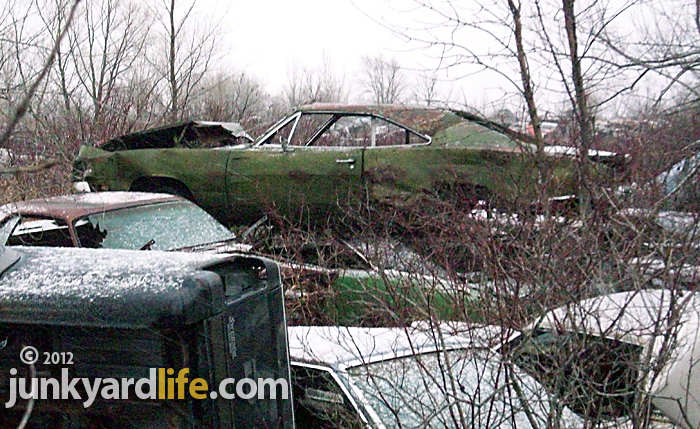 Hundreds of muscle car-era Mopars, including Chargers, Challengers, Road Runners, Duster and Darts are piled in a snowy field at a junkyard in Western Minnesota. Our good friend Joe Marano, of Ham Lake, Minnesota, sent us the goods on the yard after spending five hours on a blustery day searching for parts. "The yard is out in the sticks," said Marano. "The owner gave me the impression that cash talks and every part or car has a going home on your trailer price." Joe Marano found plenty of Mopars in this Minnesota junkyard. Marano took a friend and his two sons, Alex and Nick, on the day-long Mopar adventure. 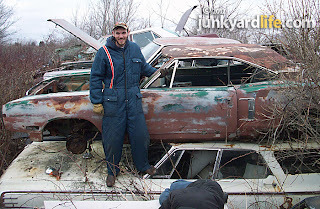 A snow suit helped fend off the 15-30 mph winds and 30-degree temperatures as Marano explored the mystery yard which also includes a section of GMs and Fords. "I dug through the Mopar and a few GM’s that had trickled into the Mopar pile for 5 hours until they closed. I think I only got through 75% of them," said Marano. "I ran out of daylight!" 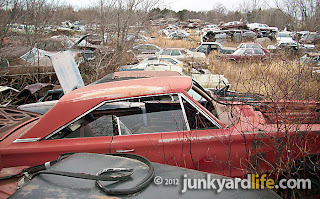 The junkyard is massive and easy to get lost in. Marano had to use his cell phone to locate his buddy. 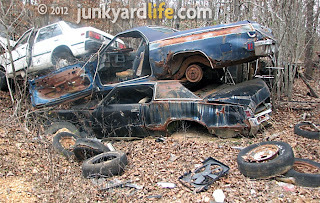 "It is easy to get turned around and overwhelmed with the massive scope of Mopar muscle just stacked and rotting away." 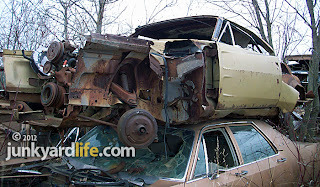 White 1968 Dodge Charger with a Challenger resting on its roof. 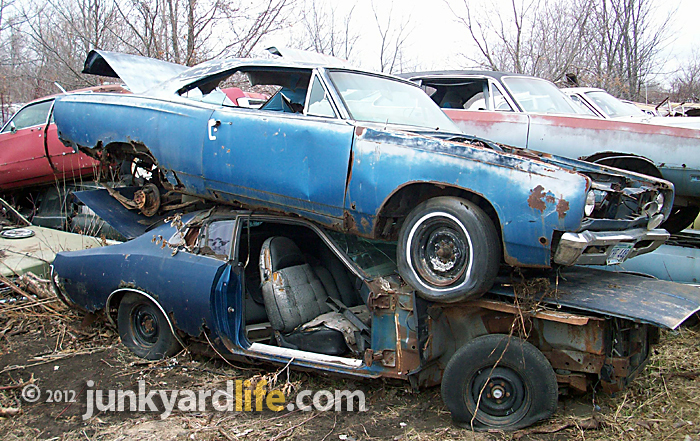 1968 Plymouth Road Runner (top) in Bright Blue Metallic (QQ1 paint code). 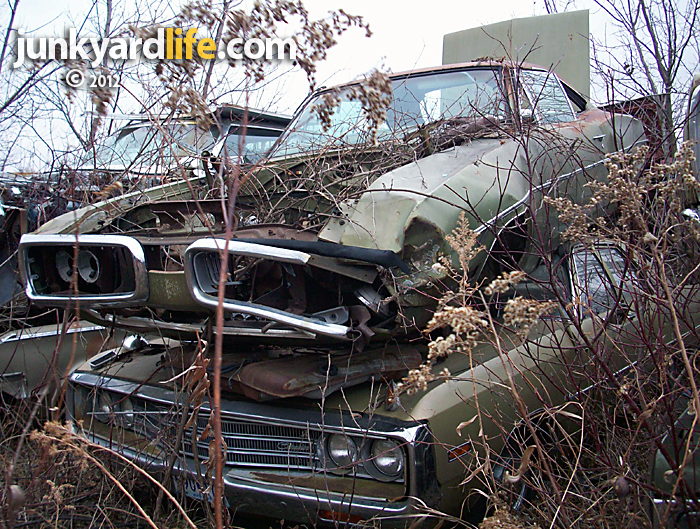 "If you count closely there are nine 1968-70 Dodge Chargers and those are only the ones I found," said Marano. "It broke my heart to see the '68-'69 Chargers, almost every one of these are still build-worthy. 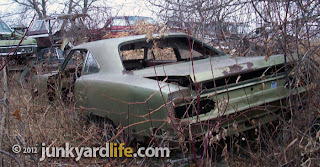 The saddest one was the '68 R/T with the quarter panel stripe." A 1968 Dodge Charger R/T is a rare sight at any junkyard. Too many cars to see can be a pain in more than one way. 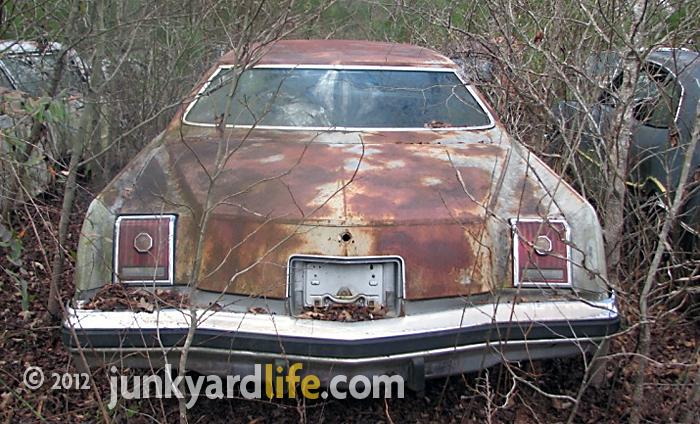 "We got lost in the Mopars section and ended up in the GM cars," Marano said. "That field was so full of cars that you cannot see them under the brush and I walked into one with out seeing it." The level of difficulty navigating the yard escalates in Spring and Summer. 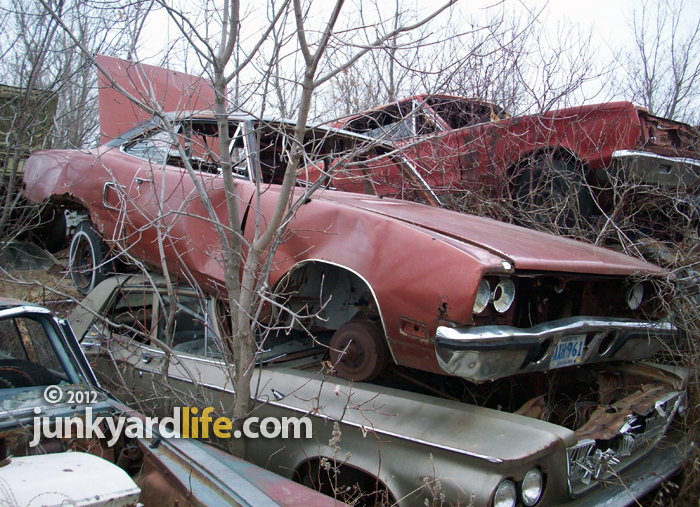 1968-'69 Chargers are abundant in this Minnesota junkyard. Must be a 1968-1970 Charger parked next to the '66 Charger. 1974 Dodge Challenger (E-Body) in B1 Powder Blue sits atop a white 1968 Charger. 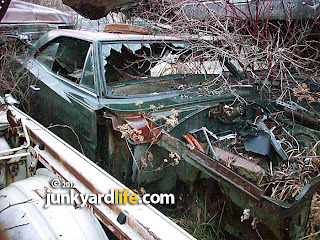 Front end parts were recycled on this Dark Green Dodge Charger years ago. Rallye Green 1969 Dodge Charger rests beneath a less flashy medium green Charger. Y3 Yellow 1969 Dodge Charger has shed a few parts but the engine remains in the K-member. Minnesota winters have not been kind to the sheet metal on classic Mopars. Dodge sold a lot of green Dodge Chargers in 1969. 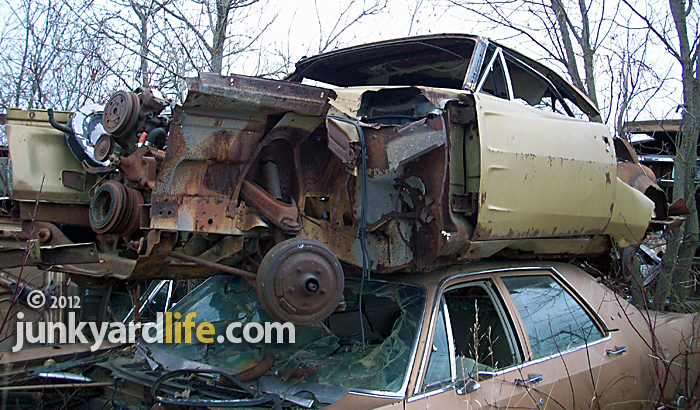 A good body man would have his work cut out on this Dodge. Wow! 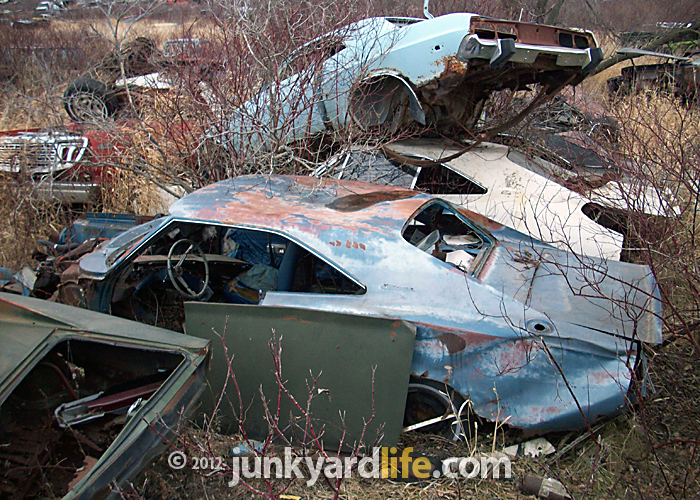 A Plum Crazy 1970 Dodge Charger hidden in this junkyard graveyard. The 1970 Dodge Coronet/Super Bee with its like-it-or-not, double hoop front bumper was a one-year only design. 1970 Plymouth Road Runner is a muscle car restoration in waiting. 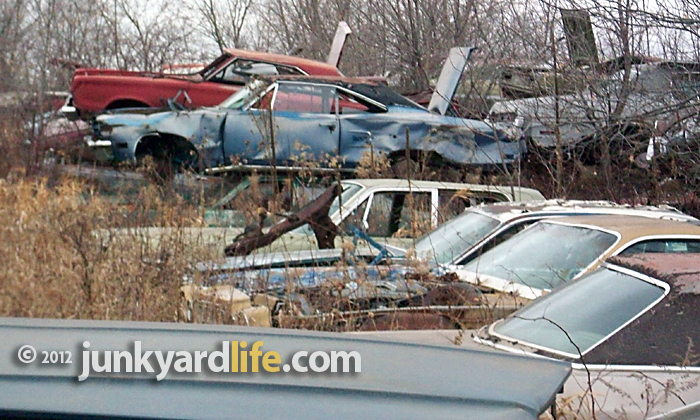 Wrecked blue 1970 Plymouth Satellite stands out in a sea of junked cars. Plenty of desirable parts left on this 1970 Plymouth Satellite. Closer look at the red interior on the 1970 Satellite. 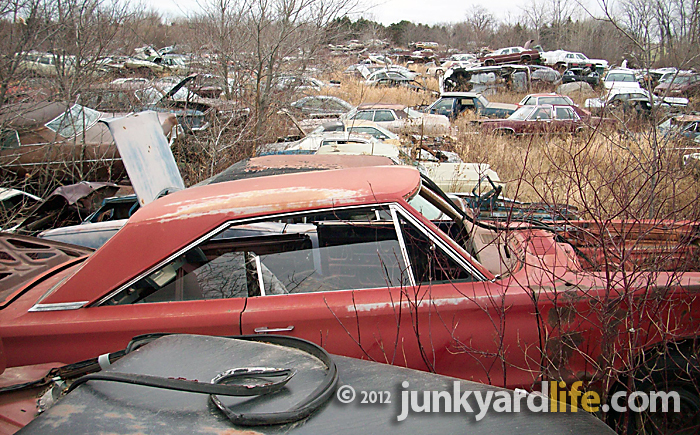 1967 Dodge Coronet in red among the many Mopars in this junkyard. 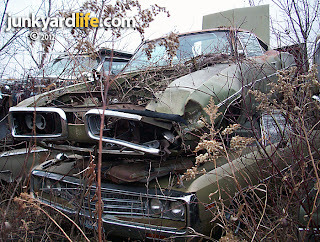 Thanks to Joe Marano for sending us the photos of the Minnesota Mopars. I will have more Mopars from Joe Marano soon. 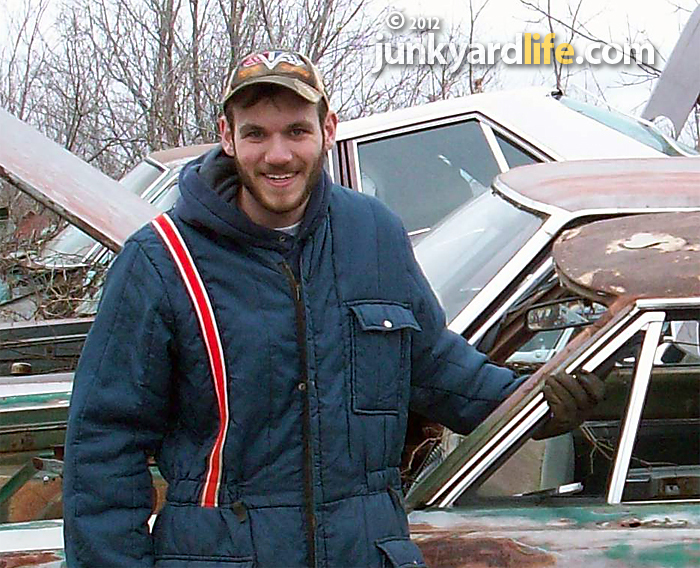 Marano has a passion for old cars and operates Junkers Towed by Joe in Minnesota. The accidental Pontiac Grand Prix junkyard crawl. 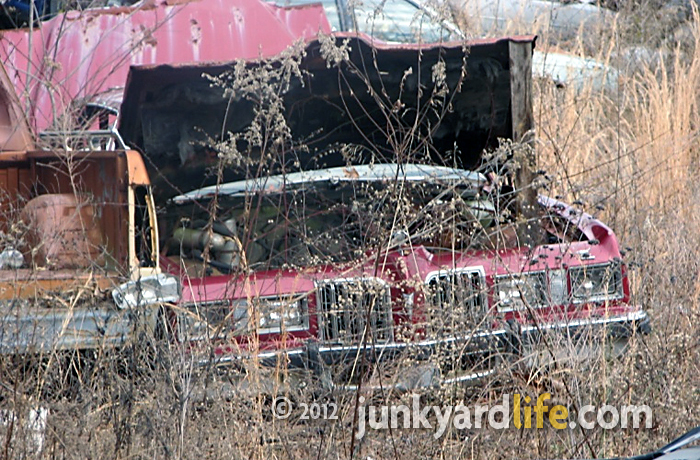 It was actually a Junkyardlife Adventure day when Anthony, Jody and I took to the highway to spy our eyes on some cool out of the way junkyards. I, however turned the day into…drum roll, please…. Ron’s Grand Prix Adventure! 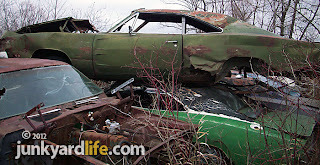 Although, more realistically we were all on quest for other things-like a whole host of things for a 1955 Chevy sedan, that I am wrenching on, and odds and ends for Firebirds, which we all three own. I just have a strange addiction to Pontiac Grand Prixs and I had a feeling these off-the-beaten path junkyards may produce. This 1969 Grand Prix Model J (top photo) was one of the first things we saw at Gibbs junkyard in Attalla, Alabama. Also the belly of the GP was one of the last things seen by the unfortunate Mustang II beneath it. How did this happen? 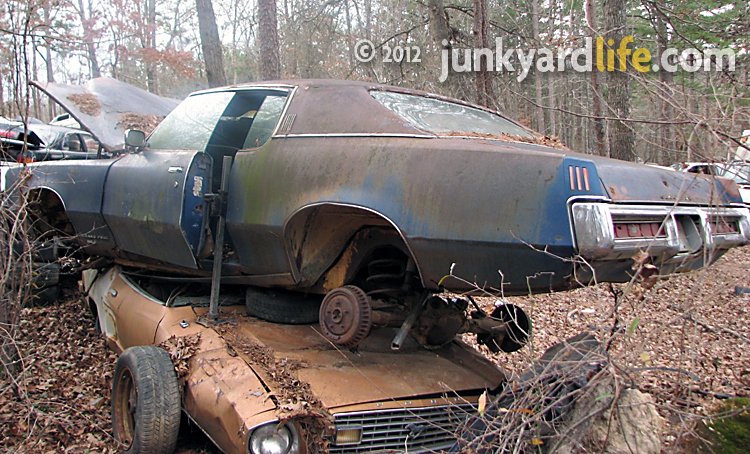 This blue beauty was full of great parts and didn’t need to be there in the first place. Odd find of the day # 1: This car was equipped with a 400 engine and 2-barrel carburetor. 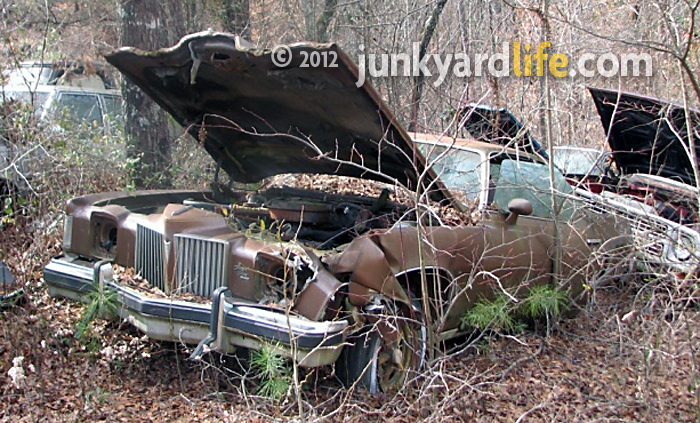 This gentleman’s muscle car could have used a bit more to drink in its day. 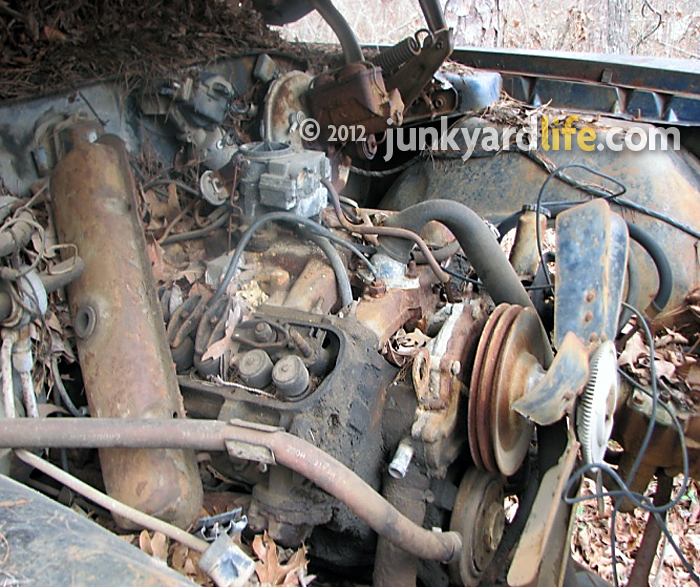 You never associate, or even hear of, Grand Prixs of this era to have a miserly, 2-barrel carb. Did John DeLorean know about this? 2-barrels are not better than one 4-barrel. See what’s missing? 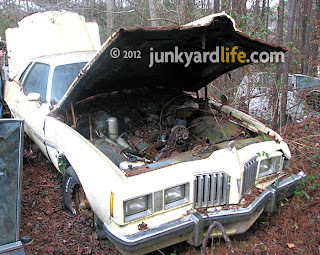 Three years earlier, Pontiac offered three 2-barrel carbs on top of your motor! You can bet John DeLorean knew about THAT! Park the classic ’71 Grand Prix on top of the econobox! May I direct your attention to the 1971 Grand Prix in this painful slide? It’s on the bottom. Of course it is. I studied this car for a while and determined the damage this Model J sustained did not come from an accident during road duty. I feel the damage was done after someone’s bad decision to allow the Grand Prix to come here. I also noticed a Gadsden State parking sticker from long ago. The white thing on top we will never miss. The El Camino in the middle is also a shame, making lots of readers cringe, but the Grand Prix on the bottom? Unforgivable. Bench seat, no tilt in a Grand Prix. What happened? Odd find of the day # 2 is really more of what you don’t find on the black 1971 GP. Most Grand Prix models even in basic form had some options. Most restored and rescued models you see are equipped with bucket seats, consoles and power everything. 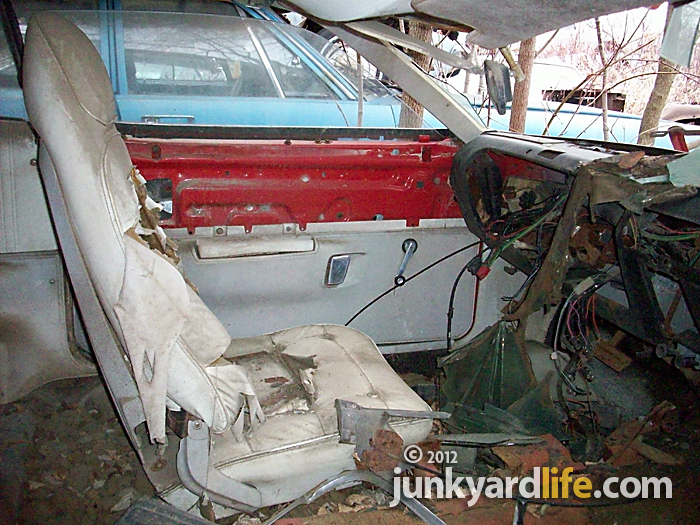 This character has a basic bench seat and a column shifter. It doesn’t even have tilt wheel. Weird. Factor in the manual windows and it makes you wonder why the original owner sprung for the spendy Grand Prix, seeing as they could have gotten a much cheaper car with these same features. Grand Prixs without power options are unusual. I think I had a refrigerator this color when I was growing up. This ’75 Model J was wearing its original Rally II wheels. 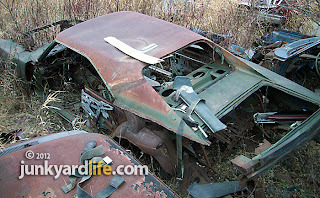 It appeared to have lost a battle with a fork lift. This car didn’t have tons of options either. 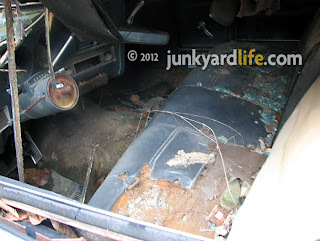 It did have bucket seats, though! Despite not having an attractive color and lacking a lot of options that I would prefer to have, this may have been my favorite Grand Prix of the day! 1975 Model J Grand Prix interior. Base 1977 Grand Prix in red This ’77 was pretty much a base model with a lot of standard issue equipment. By 1977 the Grand Prix was losing its somewhat pricey reputation. Pontiac offered more entry-level priced cars due to harsh economic times and a “do what you have to do to sell cars” mentality. Want to bash your Toyota Camry into this bad boy? 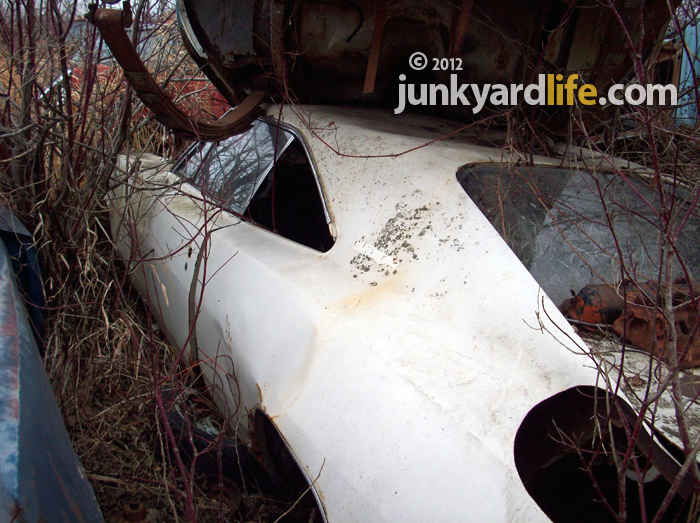 This 1977 GP we found off the beaten path in the weeds was very intact. Again, a base model. I am starting to see a pattern here. SJ’s! Where art thou? What year is that Pontiac Grand Prix? Wait! Another Grand Prix! I couldn’t believe it! I could see no good way to get to it, as it was surrounded by huge barriers and briars that were trying to eat us. I had to check this out. Jody and I still got luckier than Anthony — while we were “Indiana Jones”-ing our way to this white Pontiac GP — he was simultaneously finding his elusive Buick at the bottom of a ravine. It turns out free-falling is much better if one has a parachute. What's a Grand Prix like you doing in a place like this? Made it to the white GP. Crud! Another ’77. It’s not that I don’t like the 1977 models. When I endure physical strain and pain to see a Grand Prix, I would prefer it be a ’73-’75 SJ model or LJ model with a 455-cu. inch engine and tons of comfort and go fast options. These cars were special! Not so much an entry-level ’76 or ’77 with square headlights and base equipment. Although in ’76 and ’77 you could still get a big but not super-powerful engine (455 for ’76 and in ’77 a 400 was top dog.) 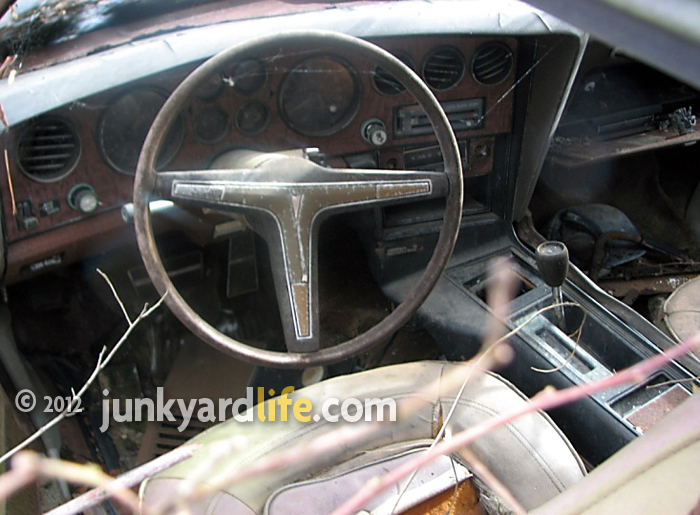 Still with the SJ package you got bucket seats and often comfy velour. Dare I say a ’76 or ’77 was (gasp) “common place”? No, I will not go that far because they are far from common today and if the right ’76 SJ came along I would fall into its loving trap. They were just easier to get with run of the mill options by then. Pontiac actually commemorated their 50th Anniversary in 1976 with a Golden Anniversary Edition Grand Prix. 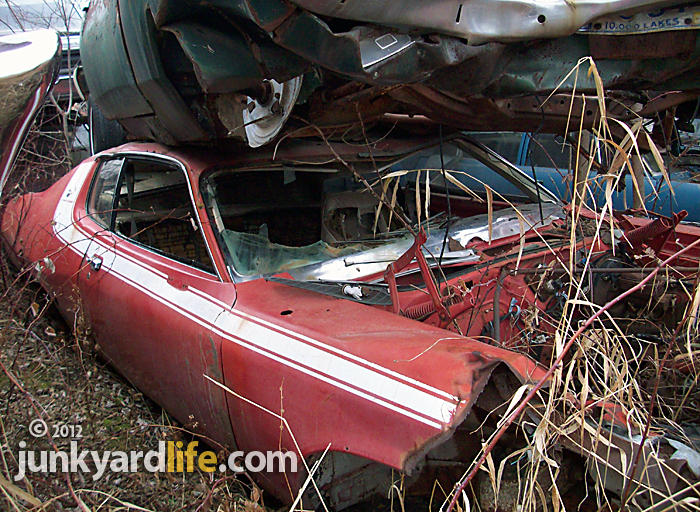 4,807 of these “golden opportunities” were produced, many of them with Hurst Hatches in the roof. Think how cool that would have been — a brand new 1976 Golden Anniversary 455 Grand Prix with bucket seats and the tops out on a cool fall night with Starbuck’s “Moonlight Feels Right” playing on the stereo… See? Can you feel it? I can! Although the ’73-’75 models pull me in like a classy magnet, I can see the attraction to any Grand Prix of this generation. Happy Hunting!